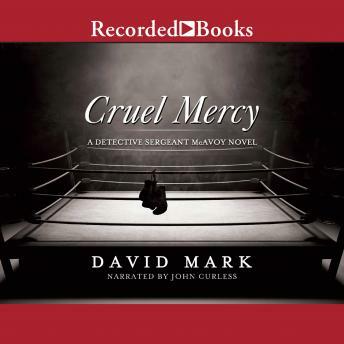 The latest installment in David Mark's internationally acclaimed Detective Sergeant McAvoy series, Cruel Mercy is McAvoy's first adventure on American soil. In the New York Police Department's 7th Precinct on the Lower East Side, Detective Ronny Alto is investigating a crime that's left one man dead and the other in a medically induced coma after surviving a shot to the head. One hope is that Brishen Ayres, a boxing coach and legend in the gypsy community in England, will wake up and reveal the person--or people--responsible for the murder of his protege Shay Helden and his own mutilation. Another hope is Detective Sergeant Aector McAvoy. Far away from his home in the U.K., from his familiar Hull, and from the guidance of his boss Trish Pharaoh, McAvoy is flown in to assist with the case, but he has his own motives for the trip: find a man named Valentine Teague--another amateur boxer, a rival of the Helden family, and, perhaps most important, his brother-in-law. But every step toward locating Valentine is a step deeper into a sinister underground network of misguided loyalty, faith, and honor that pulses beneath the streets of New York. The latest installment of the Detective Sergeant McAvoy novels, and the first to be set in the United States, Cruel Mercy finds Hull's most enigmatic detective treading unfamiliar ground in this wicked stateside thriller.